Waiting with Bated Breath: Will We Hear George R. Stewart reading his manuscript of Earth Abides? Photo copyright: MikkiPiperImaging.com Used with permission. The Bancroft Library will digitize recordings of several manuscripts recorded by George R. Stewart. In the late 1940s and early 1950s, GRS decided to record his drafts. (Before this, his drafts were written with sharp pencils, so he always kept a wad of sharpened pencils near his desk). Since tape recorders were not available, we believe he used the Dictaphone or a similar system. Over the years of researching and writing about Stewart and his works, the idea of finding those recordings and digitizing them never went away. But the big question was whether or not the Bancroft Library had the ability to digitize fragile recordings from an “ancient” format – if they existed and could be found. I am happy to let you know that we are finally moving forward with digitizing the SoundScriber discs created (we believe) by George. The process has taken quite awhile as we switched from our original plan of having them digitized by our normal vendor to having them digitized by a somewhat new and much less invasive process. Our normal audio vendor is set up to digitize physical audio formats, like the SoundScriber discs, by playing the disc on a machine with a stylus, much like you would listen to a record a home. The player is connected to some fancy equipment that records a digital file of the audio. The SoundScriber discs are extremely fragile and their inherent fragility means that playing them once might completely erase the audio. We were very nervous about the fragility and spent some time researching other methods of digitization that could mitigate the harm to the physical media. Luckily for us UC Berkeley is the home to Project IRENE, which is a project team that works on digitizing obsolete media using optics. They have spent the last few years working on wax cylinders from the Phoebe Hearst Museum and the Library of Congress. We brought the possibility of the SoundScriber process to them and they were excited for a new challenge. They have now purchased new equipment to allow for their existing equipment to “play” SoundScriber discs and we plan to start digitizing the George Rippey Stewart discs soon. The material has not yet been digitized so we still do not know what is actually on the recordings. Please let me know what questions, comments, concerns you may have about making this material available to researchers. The answer to the letter was a resounding “YES!” — from the GRS family and those of us sharing George R. Stewart with scholars, artists, and the general literate world. The backstory of events that brought us to this point is full of twists and turns. It depended on the hard work of GRS Helpers, including Michael Ward, Keeper of the George R. Stewart Wikipedia pages. I had contacted the Bancroft as a somewhat-anonymous scholar wondering about digitizing the recordings. But Stewart left strict instructions with the Bancroft: No one was to listen to those recordings without his specific written permission. When GRS passed away in 1980, permission would need to come from the family’s holder of copyright. The Bancroft Librarians began searching for the family keeper of permissions. Discovering Mike’s excellent GRS website they contacted him, asking if he could direct them to the person who could authorize the digitization and sharing of the recordings.Mike directed the Bancroft to me. I connected them with Ed Stewart, GRS’s grandson, who manages permissions since his father Jack Stewart’s death. Ed quickly gave his ok. The Librarians began the process of finding the best and safest way to transfer those fragile old recordings to modern digitized form. The letter explains the next steps they’ll take to preserve those treasures of literature. Of course, as the Bancroft Librarian says, we don’t yet know exactly what’s on those recordings. 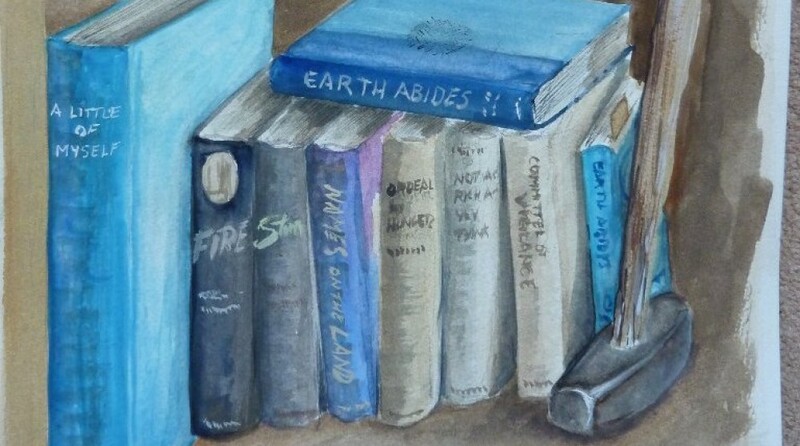 But there is good evidence that some of them contain GRS’s reading and verbal notes on his great epic, Earth Abides. That novel, never out of print, influenced writers like James Sallis and Stephen King (who based The Stand on Earth Abides), and composer-musicians including Phillip Aaberg and Jimi Hendrix (Hendrix was inspired to write Third Stone from the Sun by Stewart’s book). Stewart’s novel is one of the great inheritances from our time, to all time. GRS Composer/Scholar Philip Aaberg’s new video from Montana’s HiLine, honoring the Montana Farmers’ Union. The hope we may soon be able to hear GRS reading parts of the novel in draft form is, well, stunning. The idea that the Bancroft will share that with the world’s scholars is a credit to them and the tools of this age. It has been a long journey, indeed full of twists and turns, aided along the way by critical helpers, as our small band of scholars seeks the holy grail: To teach the literate world and the STEAM-thinking world about George R. Stewart’s books and his ideas. Now, at a summit on the Stewart Trail, we appear to be close to receiving a boon. That boon – hearing Stewart read his manuscripts – will be shared with the world. Whatever is on those recordings, I am infinitely grateful for the hard work of all who have brought GRS and his works to this point. As digitizing progresses, I’ll send updates. Stay tuned. *The Bancroft uses donations to fund such special projects, and also accepts donations of exceptional items that are within the purview of their collections. You might consider sending them a donation .